Has your 10-14 year old ever wanted to be a chef for a day? 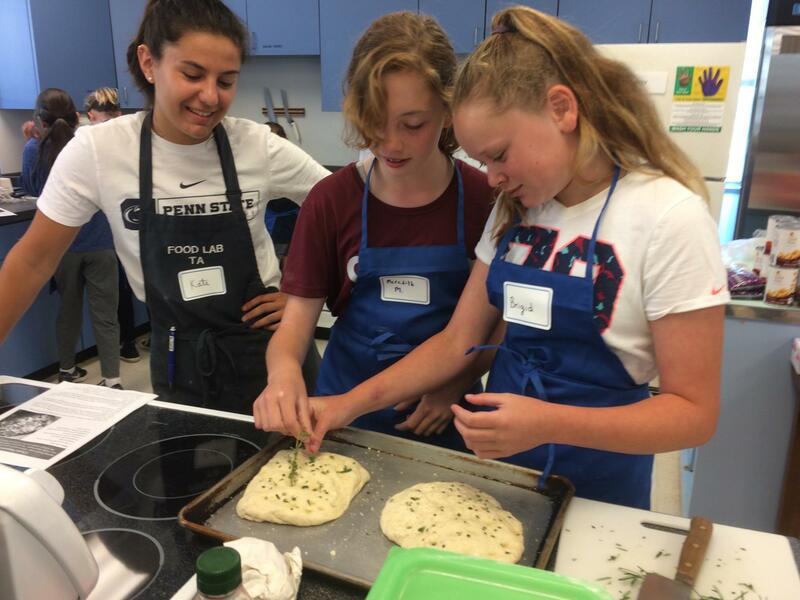 Penn State is happy to offer children one day programs where they can learn from professionals in our Foods Lab. During the day (held during local school in-service days) the students learn basic cooking techniques, then they prepare lunch. Following lunch, they make dinner to bring home for the entire family. Flavors of Fall – Our Chefs will spend the morning preparing (and eating!) a variety of recipes packed full of nutrients and fall flavors! They will learn how to make bread from scratch and then bring their loaf home to share. After lunch we will focus on soups/stews and desserts – and parents then get to take the night off from cooking, because your Chef will be bringing their choice of soup and dessert home for all to enjoy! But don’t be surprised if they say you have to do the dishes since they did the cooking. Celebrate MLK Day – Our Chefs will spend the morning preparing (and eating!) a variety of recipes with an emphasis on Southern flavors and favorites! They will learn how to make corn bread from scratch and then bring their bread home to share. After lunch we will focus on soups/stews and desserts – and parents then get to take the night off from cooking, because your Chef will be bringing their choice of soup and dessert home for all to enjoy! But don’t be surprised if they say you have to do the dishes since they did the cooking . Holiday Baking – Let your young Chef do the Holiday Baking this year! During our afternoon of baking, our Chefs will be creating a variety of Holiday cookies and treats and will then bring home a large assortment of treats to last the holiday season. Lunch is not provided, but we will take a break in our baking to prepare a couple healthy snacks along the way. The cost for November 2 or January 21 is $70 per chef and includes instruction, lunch and a bring home dinner for the family. Both of these programs are from 9 am to 3 pm. The cost for the Saturday, December 8 program is $45 and is from 1-5 pm. In this class participants will be preparing a large cookie tray and other holiday desserts.